The Army and Air Force Exchange Service (AAFES) and Marvel Comics are looking for two Servicemembers to appear in the next issue of the “New Avengers” comic book. Two members will be photographed and professionally draw for the next comic. The contest is open to all active duty, Reserve, National Guard troops, and retirees. The deadline to entering the contest is October 31st, and the drawing will be held to determine the winner at the end of November. 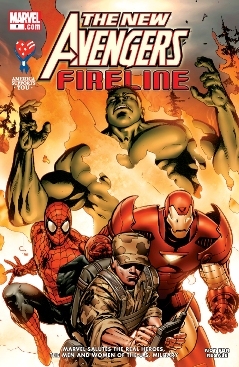 The “New Avengers” features super heroes such as Spiderman, the Incredible Hulk, Ironman, and others. You can register to win at AAFES.com. Click on the “Marvel/Saga -Unmask the Super Hero’ Mail-in Sweepstakes” on the lower left area of the front page. Or you can download the form in pdf here. Previous post: Invest a Lump Sum or Use Dollar Cost Averaging?